There's a reason Nashville is called Music City; it's always lively and full of activities no matter the season. But it is the scene of tons of festive events and activities during the Christmas and holiday season. Lights, holiday house tours, and a stay at Gaylord Opryland Hotel top the list of things to do in Nashville to celebrate the winter holidays in 2018. This 2.5-hour tour takes you around Nashville to see spectacular holiday lights displays and then on to Franklin, a southern suburb of Nashville, a historic town where the Civil War Battle of Franklin took place. You'll stop at the Lotz House, which is filled with Civil War-era antiques and decorated for the season. Expect to see a mix of residential light displays and over-the-top animatronics. 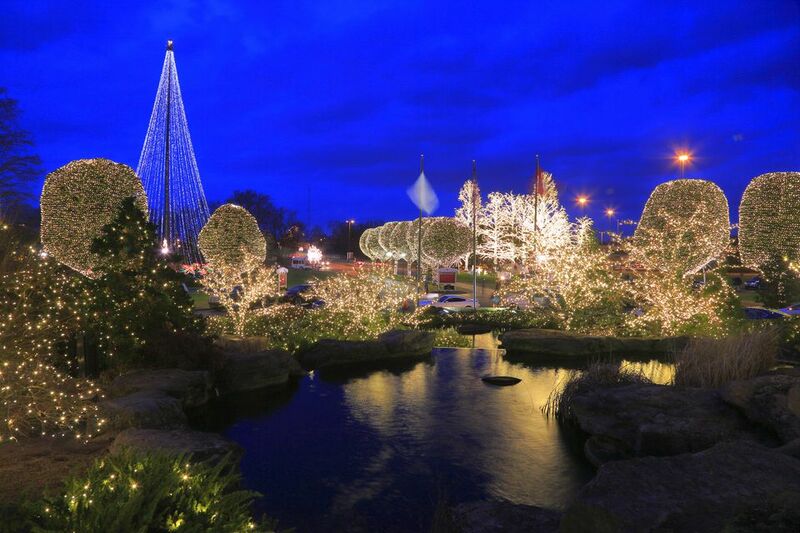 Experience some of the best holiday lights and festive displays that the Nashville area has to offer. Chad's Winter Wonderland has a drive-through Santa house, featuring Santa himself taking Christmas wish lists, a drive-through nativity scene, more than 350 pieces of Christmas scenery, a Christmas train, a dancing snowman and many LED displays. Christmas on the Cumberland has more than 1 million Christmas lights on display at the city of Clarksville's festival of lights at McGregor Park. The dancing lights of Christmas at Jellystone Park in Nashville will thrill the kids in your family, and maybe the adults, too. There's another drive-through dancing light show at The James E. Ward Agricultural Center as well (November 16 to December 31, 2018). It costs $25 per car. If you're in the Nashville area, you have plenty of places to tour historic homes during the holidays. You can tour the state's executive mansion, which is the home of the governor, during Tennessee's Home for the Holidays event. Or check out the Hermitage Holiday Tour, which is a walk-through of President Andrew Jackson's historic plantation house decorated for the season. The Hermitage is in Davidson County, 10 miles east of Nashville. The Historic Home Yuletide Tours at the Nashville Zoo will give you a chance see how the Victorians celebrated the holidays at the Grassmere Historic Home. The tours will be offered the first three weekends in December 2018. During nearly the entire Christmas season, Gaylord Opryland Hotel hosts many holiday events and is all tricked out for the holidays with festive decor and more than 3 million twinkling lights that sparkle from 4 p.m. to midnight from November 9, 2018 through January 1, 2019. Get in the spirit of the season with hotel events such as a "Charlie Brown Christmas," Cirque Dreams Holidaze, and Diamond Rio Holidays and Hits Dinner Show. And that's not all. The kids can have breakfast with Charlie Brown and his friends, and everyone can go ice skating at the hotel's rink and watch ice skating performed by professionals. The kids can ride a miniature train through Holiday Hall and have their photo taken with Santa. Go on a Build-a-Bear scavenger hunt, have cookies with Mrs. Claus, or decorate a gingerbread house. For a night out, catch a carriage at the Magnolia Lobby for a ride through sparkling Nashville, all dressed up for the holidays. From November 23 to December 31, Holiday LIGHTS returns to Cheekwood mansion for the fourth year. More than a million twinkling lights decorate the opulent property. The event has two time slops per day (5-7 p.m. and 7-9 p.m.). The experience also includes real reindeer, s’mores pits, holiday carolers, Santa, gingerbread workshops, and cash bars with wine, beer, and hot chocolate. Admission ranges from $9 to $22 for members and $14 to $27 for non-members. A Christmas Story is an annual performance held at TPAC's Andrew Johnson Theater. The show is available from November 23 to December 22, 2018. But make sure to see it now while you can—this is the show's 10th and final year. Tickets start at $45. For something a bit different, head to this Christmas-themed pop-up bar at HQ Beercade. Adults 21 and over will enjoy 3D Christmas tree displays, thousands of ornaments, 2,000 feet of twinkling lights, and a life-size Santa sleigh. Plus, there will be holiday cocktails and light bites. Try the Naughty List drink with rye whiskey, maple syrup, oloroso sherry, and almond milk topped with white cotton candy and coconut snow. The event will run throughout December 2018.